Monsters are a very important element of the gameplay at higher levels. A monster, added to your party, becomes as good as additional team member and is very useful during combat, strengthens the entire party and brings out powerful attacks. Idle Heroes Strategy Game Guide. Monsters are a very important element of the gameplay at higher levels. A monster, added to your party, becomes as good as additional team member and is very useful during combat, strengthens the entire party and brings out powerful attacks. Monsters will be available from Level 70. There are 5 different Monsters: Wolf, Owl, Deer, Fox and Dragon. Each of them has unique opportunities evolving during the improvement. During combat, you can join to your team only one Monster at a time. Each Monster must be activated before use. Monsters improves with Chaos Stones and Monsters Souls. 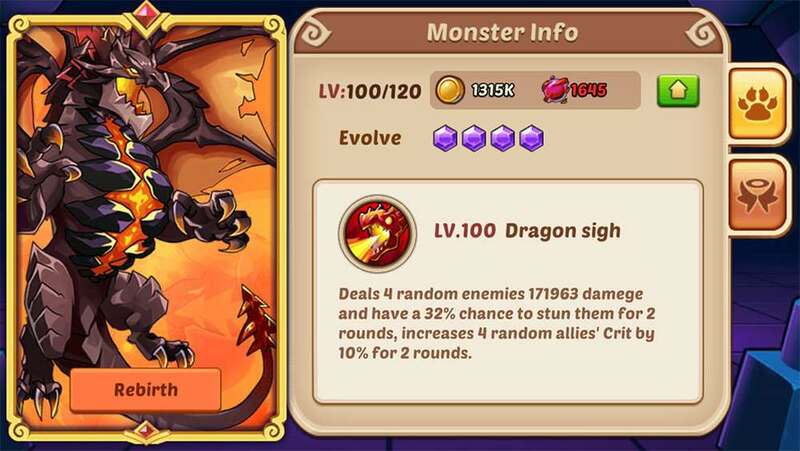 The most popular Monster is the Dragon who is considered as the strongest offensive. (After last patch all monsters are almost equal.) Deer can heal the entire team, which also seems important. There are good players on high levels who also use other Monsters. Monster development is costly and time consuming, so decide (at least for a moment) to develop one at a time. In the screen of Monster Activation, choose the Monster you like and click Activate button to activate the Monster by consuming Monster Souls. 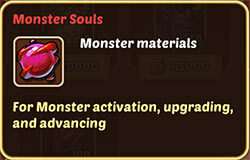 Each Monster can be activated by once and Monster Souls can be gained by auto farming or Events, dropped from stage 7-10 and up. The initial level for newly activated Monster is level 1 with 1 active skill and 1 constitution. Monster level can be upgraded by consuming Monster Souls and Gold. The passive skill effect can be enhanced according to the upgrading of levels. When the Monster level reaches to the maximum, it can be evolved by consuming Colds and Monster Souls. After Evolution, Monster's passive skills will be changed, new constitution will be opened and the level cap of Monster will be increased. You can choose Monster team-up in team-up screen. Monster's team-up will add buff on team. 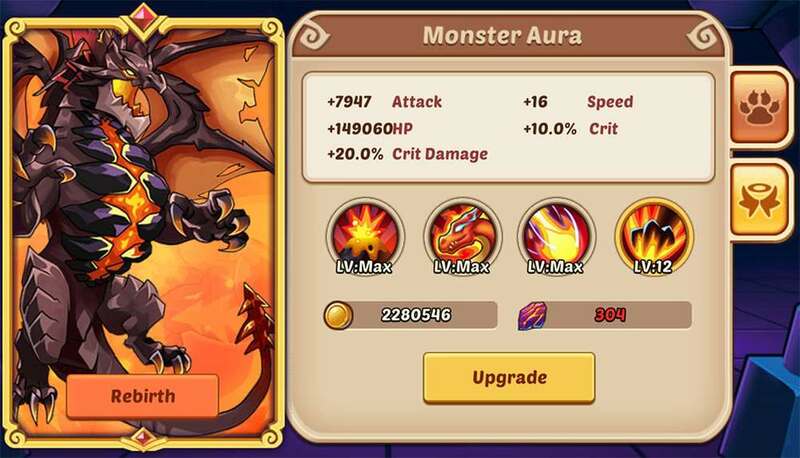 Monster will only produce passive skills in battle. Producing passive skill will consume energy and energy can be obtained after skill produced at the beginning of each round and after the skill released out by Friend team heroes. The passive skill will be released out after full energy is collected. In the Trail of Champion Arena, the player's 3 team can choose Monster with different constitutions to the battle. Monster constitutions will only add buff to the teams in battle. Monster constitution can be enhanced by consuming Chaos Stones and Gold. Chaos Stones can be gained by auto farming or Events, dropped from stage 7-10 and up. Rebirth can make Monster go back to the initial state and will return all the Monster Souls and Chaos Stones once consumed for upgrading Monster.